Our Very Special Guest tonight is Second Lady of the United States, Karen Pence, who serves as an encourager to military service members and their families. In September 2018, Mrs. Pence launched an awareness campaign to elevate and encourage our nation’s military spouses. As part of the campaign, Mrs. Pence educates military spouses about the available resources and opportunities to support spouses and their families. 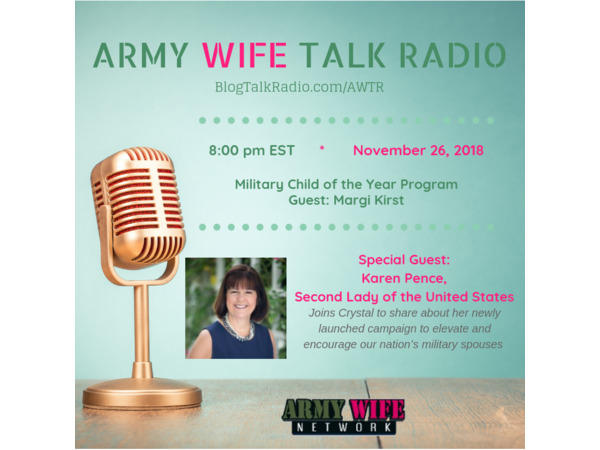 Margi Kirst from Operation Homefront will join us to tell us about the Military Child of the Year program.